Earlier this month, the metaverse development company Metaversatility launched a new showcase sim "EmVee Cuba" in Second Life (click here to teleport.) It’s a lovely, picturesque island, pushing the envelope on what is possible in SL, with each prim, texture and light placement designed to create an immersive sense of walking through a historic Cuba that never was. The builders are to be congratulated for some fine work. 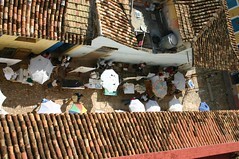 That said, I can not help but compare this more idealized vision of Cuba with the reality of life over here. 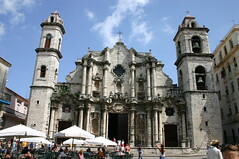 My then girlfriend and I spent a month there in the summer of 2005, and the imagery in virtual Cuba bears only passing resemblance to what we encountered during our travels. In virtual Cuba, you will find a couple of lovely fruit and vegetable stands, with tasty looking mangos, watermelon, eggplant and other produce. The reality of Cuba is that there are frequent food shortages and restrictions, to the point that most Cubans do not get access to fresh fruits like mangoes and papaya, while tourists find them plentifully in hotels all over. 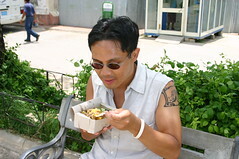 It’s actually illegal for a Cuban to eat shrimp or lobster, which are only available for tourists. that actually aren’t that bad. One place we ate at served "fritura"
sandwiches, which were bland corn fritters served in a roll. The "helado" ice cream shop in virtual Cuba reminded me of one of the few "luxuries" that most Cubans had access to, which was ice cream. Every town had very popular ice cream shops near the town center, with long lines of people waiting to get a small bowl which cost a few pennies. None had the selection of flavors like in virtual Cuba — in fact while we were there I’m not sure we encountered anything else besides strawberry. Which was kind of funny since there were of course no real strawberries to be had anywhere in Cuba. Virtual Cuba has some cheeky propaganda on the walls like this "Rezzolution" sign. The lack of advertising is very noticeable and somewhat jarring for anyone from a capitalist society like the US. The only billboards you see are propaganda from the government. 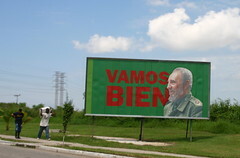 This billboard of Fidel Castro telling people "Vamos Bien" ("It’s Going Well") kind of creeped me out whenever I saw it. Bicycles are everywhere in Cuba, as a cheap and ready form of transportation. So this virtual bicycle does remind me of bikes I saw in Cuba. But cars and trucks are more common, often beautifully maintained 50s era vehicles that must have been completely rebuilt and painted several times over. Virtual Cuba has a number of shops where you can kip out your avatar in the latest SL fashion and skins. 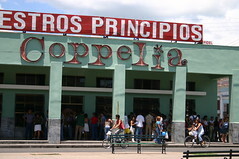 Shops are few and far between in real life Cuba, with the exception of small grocery stores and mostly empty department stores. Most proper stores only sold to tourists, like the cigar shops and guajabera shirt sellers. 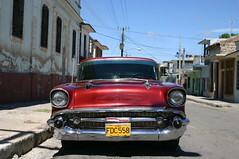 Of course what virtual Cuba lacks most is… Cubans. 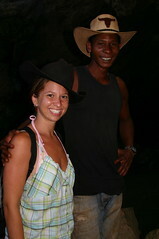 It’s the people of Cuba who are in the end what was most memorable about our trip. From the hard-edged, sarcastic Havana residents to the kind, gentle campesinos. We’ll remember the guy we met at the Malecon in Havana who insisted we go with him to eat with his family in a distant housing project outside of Havana. 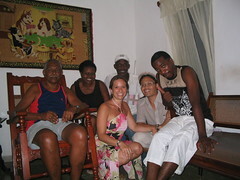 We’ll never forget the doctor’s wife who ran the B&B we stayed at in Viñales who talked about how there was both no racism in Cuba and that her daughter would never marry a black Cuban. Or the campesino who rented us a couple of horses who didn’t understand how Americans could own land and keep everyone else off of it. If somehow you managed to get Second Life to run in Cuba — where the Internet is locked down tighter than anywhere in the world except maybe Myanmar — I have to wonder what an average Cuban would think of this digital representation of their country. I imagine they might find it hilarious, in the same way that New Yorkers laugh derisively when they encounter the "New York New York" casino in Las Vegas. Or maybe they would find it sad that we had the time to amuse ourselves with unreal playgrounds like Second Life, while they lived often hand-to-mouth existences, closed off from the rest of the world. Hey Rik, thanks for the thoughtful write up. One of the motivations of building ‘virtual’ Cuba was so our Creative Officer, Matt, could have something virtual to share with his father, who emigrated from Cuba in his late teens (before the embargo). I hope he’ll respond to your post as well, but I do want to say that it’s intentionally idealized between Eduardo and our Caribbean-born interiors/detailer, Colleen Desmoulins, who put in the fruit stands (from her native Trinidad & Tobago). We can hope that our representation of Cuba will inspire people to seek out more information about the real locale, and that those who can visit will do so. I found some amazing photosets on Flickr just in looking for reference shots. Thanks, Adri. I’d love to hear Matt and his father’s take on the sim! So, as far as I see it, one of the great boons of virtual worlds, and his has been clear as long as story-telling has existed, is the ability to derivate from reality… for better or worse. Despite this, there’s still an immense predilection toward directly mirroring our own reality… building things with a heavy hand toward how they are, and only partially, sometimes, how we’d like to see them. As a tangent, I was just about to take a peek at gmaps to find Bejucal, as I remember virtually “visiting” it years ago via the same app … I was sitting with my dad, trying to orient where we ‘were,’ and the experience I had was one of an outsider looking in, at an amalgam of aerial still-shots that provide not only an accurate (if-not orthographic) geographical perspective of the town my dad grew up in. What was interesting and unexpected, was that it he was able to quickly orient himself within the way-lo-fi mirror space, and start giving me a virtual tour of sorts.. He showed me where he went to school, across from the military base… how he’d drift off staring out the window at their daily drills & excercises… how he nearly failed world history, but today still somehow knows the book he re-read back-to-front (a story you could imagine I’ve heard my whole life, and has had an impact on me to this day… which is probably why this response is turning into a fun exercise)… he showed me the canopy at the nightclub where he used to dance, where he peed in the bushes because the facilities were subpar…where he’d find a pole and lean his head against it, continuing to dance despite his exhaustion… he showed me his stepfather’s bus depot, where he started his first business selling buttons to the drivers, the baseball diamond he started his near-pro career in, etc. etc. etc. I’ll digress a bit… the point is that I was also aware of some of the negative parts of his personal history…I knew the house he lived in wasn’t only the place where his mother taught him how to cook (food I’ve eaten my whole life), but was implicitly the same place where a man his father had fired showed up to his door with a loaded gun, with plans in his mind that my grandfather was able to dissuade… he showed me a baseball diamond or a field or something, reminiscing about how much he loved baseball, how close he came to a professional career… the story that evening stopped there, but I knew that it was an eye injury and ensuing near-fatal infection that prevented that from ever happening…. Emvee’s been a pretty big proponent of nonprofit and philanthropic aims in virtual worlds (check out our Orwell video, you might enjoy it)… global kids, macfoundation, usc, lots of live music support, most of this for our profit (albeit discounted), to be sure, but we do believe in affecting some positive change in the world, in whatever small ways we can, and we plan to continue making this effort as we grow. Matt, I’ll have to read your comment again when I have more time. But for now let me thank you for an incredibly heartfelt, thoughtful and personal post. [staff] Virtual Worlds and Bowling Alone: are virtual communities “real” or not?